Peritoneal mesothelioma is an aggressive cancer caused by ingesting asbestos fibers. 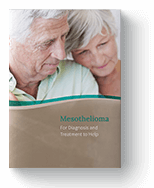 The disease accounts for around 20-33 percent of mesothelioma cases diagnosed each year, making it the second most common type of mesothelioma. Though MPM could strike any population, the disease is found primarily in the 50- to 69-year age group. Further, it is more common in men, possibly because of the higher male occupational exposure to asbestos. The incidence of occupational and environmental asbestos exposure still remains a public health problem around the world, with a significant increase in the past two decades. If you have been exposed to asbestos, please see your doctor immediately. Although there is no cure for mesothelioma, treatment advances have made it possible to extend the length and quality of life in patients. Bridda, Alessio, Ilaria Padoan, and Roberto Mencarelli. "Peritoneal Mesothelioma: A Review." Medscape General Medicine. Medscape, 2007. Web. 14 Jan. 2018. "Cytoreductive Therapy." CancerCenter.com. Cancer Treatment Centers of America (CTCA), Jan. 2017. Web. 14 Jan. 2018. Roy, Florence Le, Maximiliano Gelli, and Antoine Hollebecque. "Conversion to Complete Cytoreductive Surgery and Hyperthermic Intraperitoneal Chemotherapy for Malignant Peritoneal Mesothelioma After Bidirectional Chemotherapy." SpringerLink. Springer International Publishing, 28 Aug. 2017. Web. 14 Jan. 2018.